Impossible indeed. 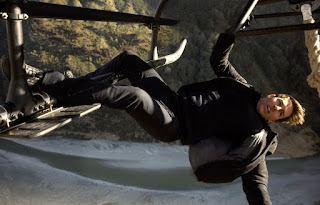 The “Mission Impossible” films, paradoxically, just get better with each progressive entry. Sure, the films sometimes take a more dense script route, weaving in death-defying stunts with talky scenes of spy jargon and exposition but the plot is just an excuse for truly magnificent camera work. It’s part 6 people, we basically want to see Tom Cruise ride a rocket to the moon. Like ON the actual rocket. Taking a cue from the big budget, practical stunts of Christopher Nolan’s best work and the recent James Bond entries, “Mission: Impossible-Fallout” tries to outdo itself by featuring some truly jaw-dropping set pieces that have to be seen to be believed. Let's not forget the almost unbearable tension as we watch the actors who are really there, hanging off helicopters and cliffs, selling the crap out of it. And I’m buying it. This sixth entry in the increasingly insane spy thriller series, take a cue from real life and as it’s title suggests introduces NUCLEAR WEAPONS. Plutonium is such a hot commodity in films after all it’s what gave the DeLorean power in “Back to the Future.” So obviously, the leftover terrorists from the dismantled, evil “Syndicate” from “Mission: Impossible-Rogue Nation”, want their hands on the stuff. These “Apostles” as they’re referred to are the prime targets for our hero Ethan Hunt (Cruise) and his IMF team of Benji (Simon Pegg) and Luther (Ving Rhames). Returning from the fifth film is former MI6 agent Ilsa (Rebecca Ferguson). There’s a new director at the CIA played by new-to-the-franchise Angela Bassett. Of topic, does Angela Bassett ever age? But I digress. She instructs a member of the CIA’s Special Activities Division to follow along with Hunt and his team. He’s Henry Cavill, and even though the guy doesn’t have the most charisma in the world, he has found a nice role opposite the 100-wattage bulb that is Tom Cruise. But enough about plot and stuff. This movie has enough car chases and helicopter chases, and HALO jump scenes, and bathroom fist fights to fill an entire action franchise. It’s shot and edited with precision. Director Christopher McQuarrie (who also scripted) returns from his first time up at bat with “Rogue Nation” and it’s a sheer delight to see what crazy stuff he’s able to pull off this time. He captures the action brilliantly; how cinematographer Rob Hardy was able to capture what he did (using a mix of digital and actual film) is simply crazy. The final act of the film, which I will not discuss whatsoever, is also an example of perfectly calibrated suspense. You don’t really believe for a minute that anything horrible is going to happy to any of our heroes and yet the nail-biting finale is so utterly intense you may need to have your cardiologist on standby. Lorne Balfe’s pulse-pounding score is not unlike Hans Zimmer’s Dark Knight music and it really works here; it’s not surprising that the two composers have collaborated on several occasions.